TAOISEACH ENDA KENNY has said that he would consider holding a public inquiry into allegations of a smear campaign against garda whistleblower Maurice McCabe, and that he would discuss the matter with Fianna Fáil leader Micheál Martin tomorrow morning. It is believed that Martin was meeting McCabe, himself, this evening amid political pressure on the government to hold an inquiry in public after a statement issued by McCabe this afternoon. 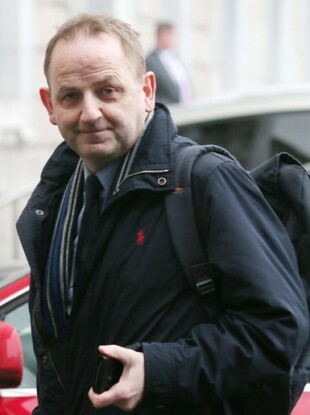 In a statement released this afternoon, Maurice McCabe has called for a full public inquiry into the allegations made against him, saying that “there is no reason to have any secret or private inquiry”. In a joint statement with his wife, Lorraine, McCabe said that they have endured “eight years of great suffering, private nightmare, public defamation and state vilification” after he had brought public attention to issues within An Garda Síochana. Speaking earlier today, the Taoiseach reinforced that a commission of investigation would set out to establish the truth as quickly as possibly. The couple said, although Health Minister Simon Harris said that they were entitled to “truth and justice”, that they wouldn’t get that if they had to wait 18 months for the findings of a private inquiry. They reference that state investigations, such as the O’Higgins Commission and internal Garda investigations, were all conducted in private and say that the public “has little or no appreciation of what was done, and attempted to be done, to Maurice in the course of its hearings”. They say that the allegation made of sexual abuse in 2006 against Maurice, “against the background of the current Tusla controversy”, was attempted to be used during the O’Higgins Commission as part of “repeated attempts” to discredit “his motives and testimony”. For these reasons, we have consistently submitted that any further inquiry into these matters must be a public inquiry. The McCabes call for a number of questions to be answered in the course of a public inquiry. They include if senior gardaí were formally or informally notified of the alleged sexual abuse case against McCabe, which gardaí were involved in the claim, and why McCabe was not informed of these allegations in 2013. We are entitled to know and to be informed by members of Dáil Éireann acting on our behalf and on behalf of all citizens concerned with the truth of these matters, whether the present or former members of the government were briefed formally or informally of the making of such allegations at any time by An Garda Síochana, or the Commissioner of An Garda Síochana at any time since August 2013. The McCabes say that the answer to these questions could be given now and put in the public domain without prejudicing any future public inquiry. They say that if these questions were answered now, “the public will be in a position to know who to believe”. Fianna Fáil justice spokesperson Jim O’Callaghan issued a statement this evening backing McCabe’s call for a public inquiry. He said: “Fianna Fáil has long maintained that the response to this issue must have the full support of the McCabe family. Accordingly we fully support their call for a public inquiry to be conducted into this matter. We also believe a public inquiry will benefit An Garda Síochána and the general public. Labour leader Brendan Howlin also supported the call for a public inquiry. Email “'We are entitled to the truth today': Kenny to discuss McCabe public inquiry with Micheál Martin”. Feedback on “'We are entitled to the truth today': Kenny to discuss McCabe public inquiry with Micheál Martin”.